Y&T is one of those bands that had a lot going for them musically but couldn’t catch a break with commercial success. Their late ’80s attempts to chase the almighty dollar with a more mainstream melodic rock sound ended up alienating the fan base they had build up since the late ’70s and then it wasn’t too much longer before their style of rock went out of style. That was then and this is now! In more modern times veteran rock bands are experiencing a renaissance in terms of live events and top quality albums. While I can’t vouch for the live shows, Y&T definitely has delivered with a brand new studio album that hearkens back to the ’80s heyday for this style of hard rock. 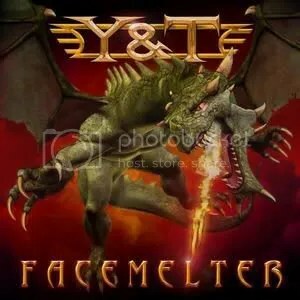 The only Y&T album I’ve owned before purchasing Facemelter was Ten. It was okay but nothing special so despite always reading praise of the band’s earlier works I wasn’t sure whether this album was going to be any good. I saw a few mixed reviews for it online but decided to try it out for myself after listening to some samples and a number of songs immediately stood out to me… I even enjoyed the intro! The general consensus amongst Y&T fans now seems to be that this album is good but doesn’t compare to the albums like Meanstreak or Black Tiger. Of course, you’ll hear that about most new releases from an “old” band. For my money, going in oblivious to what Y&T had done in their early days, I’m loving this album. “On With The Show”, “How Long”, “Shine On”, “I’m Coming Home” are all great melodic hard rock numbers and David Meniketti’s voice is just as strong as ever and his guitar playing is superb. There’s also a great ballad on here called “If You Want Me” and then the bluesy “Gonna Go Blind” is a really cool number featuring lyrics about masturbation that would make AC/DC proud. The album closes with “One Life”, which is a really good instrumental. Facemelter delivers for fans of melodic hard rock. Maybe Y&T aren’t as fast or as heavy as they used to be but c’mon their first album was released in 1978! Cut’em some slack! Easily one of my favorite albums of 2010 and well worth seeking out. In fact, the only gripe I have is the album cover which looks like something from the animated movie How To Train Your Dragon. I must admit though that it’s pretty cool Y&T recruited the same artist that they used for some of their early albums. A lot of Y&T fans don’t care for this album. I didn’t get into the band until early 2007, but this album works for me. It’s not going to knock your socks off, but it’s still pretty enjoyable, even if it is (as some Y&T fans complain) very slick and polished and some songs are have borderline generic 80s hard rock sound.